Black and white. 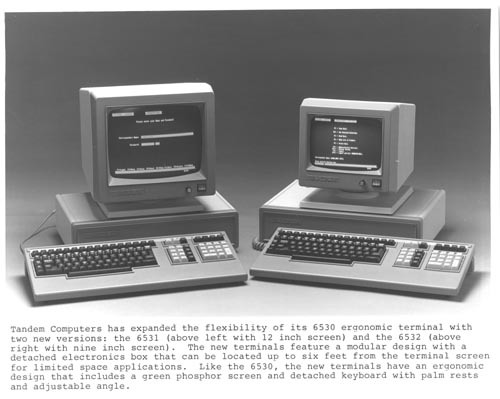 Image shows two terminals with keyboards and screens. Recto: metadata bottom margin: " Tandem Computers has expanded the flexibility of its 6530 ergonomic trerminal with two new versions: the 6531 (sbove left with 12 inch screen) and the 6532 (above right with nine inch screen). The new terminals feature a modular design with a detached elecrtronics box that can be located up to six feet from the terminal screen for limited space applications. Like the 6530, the new terminals have anergonomic design that includes a green phosphor screen and detached keyboard with palm rests and adjustable angle."